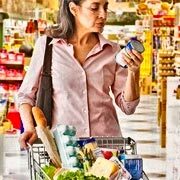 There are so many things that we don’t know about what we eat, and most of these things are easily revealed in ingredient labels. We become what we put into our mouths and if we look at the ingredient label we will definitely be shocked at what we have been making ourselves into. There are food items containing ingredients that have very complex names that sound like they should not be on your plate but on some chemist’s scientific journal. Other products don’t necessarily contain what they initially claim to have on the front cover. Some foods that claim to have whole grains may actually contain a lot of sugar instead of grains; some even claim to have no trans-fat but the ingredients list would reveal the presence of partially hydrogenated oils which are sources of trans fat. Some of these ingredients in your food will actually make you go blue! Reading the ingredients list is a good measure to keep us aware of what food products actually contain. Here, there is a rule of thumb – the ingredients are listed according to the amounts present in the food product, hence, the first two or three ingredients are those that compose the bulk of the food item. The ingredients at the end part of the list are present in very negligible amounts. Look for the word ‘whole’ like in ‘whole grains’. Products claiming to contain this ingredient should have a good helping of this component in the product, so the word ‘whole’ referring to wheat, oats, rye, or other grains should either be the first or second item on the ingredients list of breakfast cereals, crackers, pasta, and bread. To further verify this, check the fiber content of the food item on the nutrition facts panel. If indeed, your food item contains whole grains, then it is supposed to deliver at least 3 grams of fiber per serving or even more. Be wary of hidden sugars like fructose, sucrose, or dextrose. The roster of foods containing a wide selection of sugars has grown in leaps and bounds; these sugars are heavy on calories but low on nutritional content. All ingredients with the ‘ose’ at the end are sugars. The same goes for honey and corn sweeteners. These two sweeteners have a similar effect on the body’s metabolism as other forms of sugar; as such they can contribute to weight problems. The amount of sugar in the product can be seen at the nutrient facts section. It would help to know that four to five grams of sugar is equivalent to one teaspoon. Products that contain partially hydrogenated oils are sources of the dreaded trans-fat. This kind of fat damages your arteries more than saturated fat. The ‘trans-fat free’ claim actually allows up to half a gram of trans fat per serving, so, it would be wise to check on the partially hydrogenated oils content instead. If you regularly consume an item that has partially hydrogenated oils, then make the healthy choice and junk this food product, but keep balance in mind. Replacing partially hydrogenated oils with saturated fat can be just as harmful. Healthy alternatives would include tub margarines, canola, corn, safflower, soybean, and sunflower oils which contain liquid vegetable oil and no more than two grams of saturated fat per tablespoon. Look out for the dreadful artificials. Artificial sweeteners like sucralose, saccharin, aspartame and acesulfame can actually help you cut down on your calorie intake, but be warned, because you should take these only in moderation or pose serious health risks to yourself. These artificial sweeteners can be very dangerous in large quantities. If you are a soda-monster and you opt for sugar-free or diet soda, you might as well switch to flavored, carbonated water beverages. Foods with sodium nitrite and sodium nitrate can be cancerous. These ingredients, which are used as meat preservatives, are quite controversial. There are claims that these chemicals can interact with some medications, damage DNA, and pose a cancer risk. Beware of the bad colors. Artificial colorings in food also give you an artificial sense of pleasure because these don’t add any nutritional value to your food and some may even be dangerous. Food colorings like Yellow 5, Yellow 6, Red 40, Red 3, Blue 1, Blue 2, Green 3, and Orange B which are commonly found in cereals, candies, sodas, and snack foods, may make your food look pretty but don’t exactly give you a pretty bill of health. The flavor enhancer, Monosodium Glutamate (MSG) may not be seriously dangerous but some people tend to have hypersensitivity reactions to this additive. There are those who experience headache, flushing, sweating, palpitations, and shortness of breath. This makes a lot of sense, I think most of us forget about the ingredients page!